The Humble Bundlers have just released another big bundle of games with a trio of tiers starting from pay-what-you-want. This time around the bundle will probably be pretty popular as it features many great titles from Rockstar Games. Humble bundle says that you can net $196 worth of games for the top tier price of US$15. Another bonus, for some, is that Rockstar is donating all of its share of any proceeds raised to the Rainforest Alliance. There is no option to send any cash to the developer and by default the sum you pay will be split to this single charity, with about 20 per cent allocated to a Humble tip. With the entry level tier you will get Manhunt, Grand Theft Auto: Vice City, Grand Theft Auto 3, and Max Payne. Remember, as usual, you have to pay at least US$1 to qualify for the Steam keys for the games. If you beat the average price, which is currently US$9.54 you can add the following to your haul; Bully: Scholarship Edition, Grand Theft Auto: San Andreas, L.A. Noire, and Max Payne 2: The Fall of Max Payne. All these games have garnered ‘very positive’ feedback on Steam. 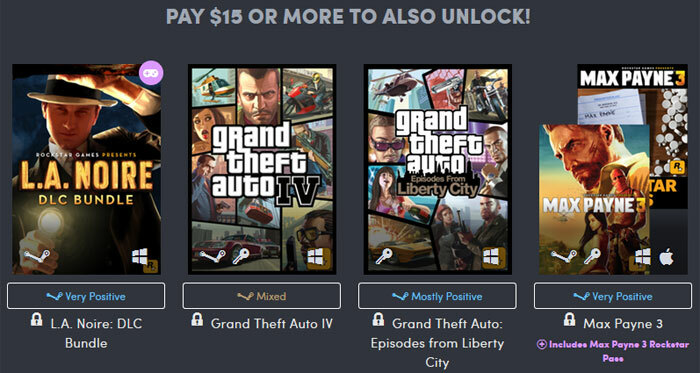 For the set fee of US$15 the Humble Bundlers will also give you the codes for; the L.A. Noire: DLC Bundle, Grand Theft Auto 4, Grand Theft Auto: Episodes from Liberty City, and Max Payne 3 with the Rockstar Pass. As usual you have a fortnight to buy this bundle, with thirteen and a half days left to go at the time of writing. 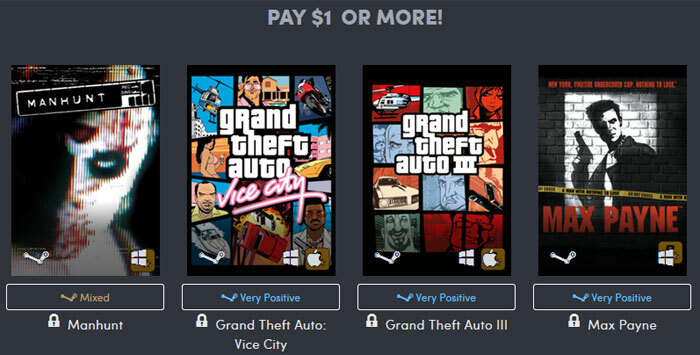 Fabulous bundle if you're new to Rockstar's games. Though not for me as I've only not played L.A. Noire, and if I want to play that I'll get the remaster edition on Xbox One X. Still good games, and that's a damn good price for them. For me Vice City is still the pinnacle of the GTA series. Didn't even hesitate getting credit card out for this over my cornflakes this morning. Some cracking old skool buzz for your bucks there.